Farmers Markets Cheaper than Supermarkets? 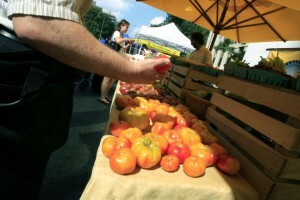 A customer examines heirloom tomatoes at a farmer's market near the White House. Corner stores could be one solution to D.C.’s food deserts, but what about farmers markets? A new study of Vermont farmers markets found that many conventional grocery items were cheaper at farmers markets than at large supermarkets. And what’s more, organic items were 40 percent cheaper at farmers markets than supermarkets. We’re all familiar with the accepted gospel: Only well-heeled food snobs can afford the exorbitant prices charged for those attractively displayed baby greens and heirloom tomatoes at [farmers] markets, while those who can’t afford such greener-than-thou food-purchasing decisions must paw through limp broccoli, wilted lettuce, and tennis-ball tomatoes at supermarket produce departments. It seems that at least this study adds some doubt to that notion (and here in D.C., FRESHFARM Markets do accept food stamps). Organic foods, however, are still generally more expensive than non-organic items.